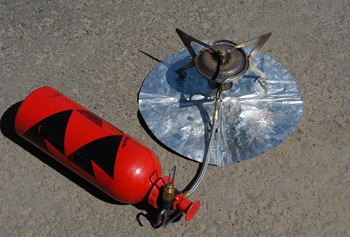 I was really excited when Mountain Safety Research (MSR) announced its Simmerlite Stove. After all, I have considered the MSR WhisperLite stove one of the true breakthroughs in backpacking equipment, especially when MSR came out with its Shaker Jet jet cleaning device. The WhisperLite was/is light weight, rugged, easy on fuel, and a cinch to field maintain, as long as one did such regularly. Now, it is true that one has to "RTFM," as they say, since it is important to know how the stove works. When on the trail with some of my friends, who would claim they were having problems with their WhisperLite, and I would ask them: "When was the last time you oiled your pump leather?" Many of them would give me a blank stare, and I knew right then that they had not RTFM'd. But assuming you did maintain the WhisperLite, it works like a charm. So as I said, I was pretty excited when MSR announced the SimmerLite. Sure, it cost $100, but it would be worth it, if it could simmer like the Coleman Apex II but was as rugged as most MSR stuff is. I waited about a year, and finally invested in one, and took it on a three day trip in the Spanish Peaks unit of the Lee Metcalf Wilderness. Of course, I tested it before we left to make sure there were not hidden tricks, and I confess that I was a bit surprised that there was only one valve for controlling fuel flow. But I figured that the MSR engineers knew what they were doing. And so off we went. I was impressed with the packed size, apparent weight, and sturdiness of the stove. It felt solid, even though the aluminum foil heat reflector on which the stove legs are supposed to fit prevents direct contact with the ground. But of course, the $64 (actually, $99.95) question is: Does it simmer? Well ....... As the Hertz RentaCar ads used to say: "Not exactly." "Not at all" would probably be a better descriptor. Basically, once one has fired up the stove and pressurized the fuel bottle sufficiently to boil a couple of quarts of water for dinner, you simply can not back the flame off sufficiently far to actually get the stove to simmer what you might now be cooking. When I had looked at the instruction manual that came with the stove last year, the ONLY thing I could find about how to make the stove simmer was an arcane reference to the fact that lowering the fuel bottle pressure " reduces heat output and enhances simmering." But that is from the manual that was packed with the stove in 2005. Now, if you download the operational manual from the MSR web site. You can't find the word "simmer" used anywhere (other than the name of the stove) in the manual. Maybe the instruction manual folks actually got out and used the stove themselves. But clearly, with a name like SimmerLite from a company like MSR, you could expect the stove to simmer. Such is certainly claimed on their web site. I don't know, maybe the engineers that design these stoves simply are not cooks, and that they don't understand what the act of simmering actually entails. So here is a news flash for the MSR engineers: "Simmer" means to cook something at or just below the boiling point of water. That means that when I have my freeze-dried beef in my Lipton Taco Rice mix, and it says to simmer, I don't want the stove to be boiling the glop. The Simmerlite required 10:25 and used 29 grams of fuel. The 10% difference is pretty close to the uncertainty of the measurement, but if you assume that the difference is real, it means that one would have to boil 50 quarts of water before you used up in fuel what the difference in the weight of the two stove assemblies (3 oz) is. The Simmerlite weights 306 grams and the Whisperlite weighs 385 grams. My gut feel is that Susie and I do the equivalent of boiling (including actual cooking) of maybe 7 quarts a day. So for a 7 day trip, the increased weight of the fuel consumption vs the decreased weight of the stove is a wash. Now, if that 3 oz of fuel burn drives you into a new bottle of fuel, well, you have to consider the weight of the additional fuel bottle as well. It also seemed (but I do not own a noise meter) that the SimmerLite was slightly noisier than the WhisperLite. It may simmer a tad better than the WhisperLite, but the difference in simmering capability is not, by itself, worth the purchase price of the stove. Now, we know that MSR engineers can design a stove that simmers. The Dragonfly simmers excellently, but it has a second fuel feed adjustment valve that controls the final flow of vaporized fuel into the burner assembly. Why MSR decided not to include such in a stove that they wanted to name SimmerLite is simply beyond me. After I posted the first version of this review, I notified MSR that it was up on the web and solicited their comments. This touched off a series of emails, phone calls, and further tests with the stove. Essentially, MSR claimed that what I needed to do was to avoid "over-pressurizing" the stove. By using only 5 - 10 pump strokes to pressurize a 22 oz fuel bottle filled to the fill line, I should be able to bring the water to a rolling boil and then back off the fuel flow to the point where I can simmer, and then bring the stove back to a rolling boil. So, of course, I tried their test. 6 pump strokes was insufficient pressure to eject enough fuel from the bottle so I could light the stove, so I gave it four more strokes, for a total of 10. This time the stove lit, and went to a nice blue flame, but it did seem to sputter some. HOWEVER, under these "properly pressurized" conditions, it took 18 minutes and 30 seconds to bring two quarts of cool water to a rolling boil, compared with the 10 min 25 seconds it took with an "over-pressurized" fuel bottle. Yes, I was able to cut back the flame to the point where it looked like I might be able to actually simmer, but bringing the water back to a full boil was not possible without further pumping of the fuel bottle. To me, increasing the time to boil water by 75% just to afford potential simmering is not how most backpackers are likely to use this stove. And I ran this by Lance, a hiking friend of ours who is both a mechanical engineer and a SimmerLite owner, and he agreed. Further discussions with MSR representatives. It was pointed out that their advertising says it is the best simmering single-valve stove. (That sounds like saying that a particular airplane with only a left wing will fly better than others with the same deficiency. Yeah, but the plane still does not fly very well, if at all.) There were lots of discussions about the need to learn how to tweak the stove, and work to optimize the pressure. My response to MSR was that while all this might be true, it just seemed to me that the choice of the name "SimmerLite" was a poor one, given the challenges in trying to make this stove function on a practical basis in the backcountry. I got no disagreement from MSR. When I queried MSR about the stove design and why they did not choose to add a second valve which would actually afford practical simmering capability, the response I got was that their real objective was to make the lightest weight, single valve, liquid fuel stove. Clearly, that they have done. But to use a name like "SimmerLite" when it doesn't simmer on a practical basis seems a ploy by the MSR marketing department to just piss off buyers. Again, I say to the MSR engineers: add just one more oz of weight to the stove and use it to put in a vapor metering valve. You won't be sorry. OK, let's cut to the chase. The bottom line is: we own and use four backpacking stoves: the MSR Whisperlite, Simmerlite, and Dragonfly, and the Coleman Apex II. What do we actually use when we go backpacking? Well, like everything in life, it depends. 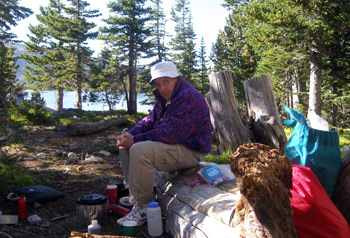 If we have a large meal or serious amount of gourmet cooking to do, like maybe roasting a couple of cornish game hens in a bundt pan, you can be assured we will be carrying the Dragonfly: great stability and flame control, but I will have to set it up a hundred feet from camp so we can converse over dinner. If we are going on a short trip where fuel consumption is not an issue, and we really need to be able to simmer (like baking brownies in our Bakepacker), we will likely take the Coleman Apex II. It gobbles fuel, but it actually throttles down to the point where water does not boil on the stove, even at 10,000 feet. If we are going on a long backpack - like an 8-night traverse of the Bailey Range or something, where fuel consumption is critical, we would likely pack the WhisperLite. 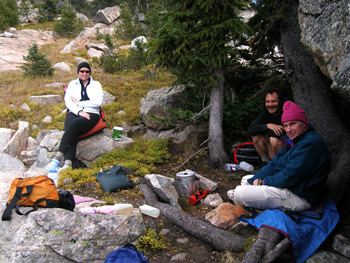 However, for most backpacks we do (typically 3 - 4 night trips in the western canyons or mountains), we are likely to take the SimmerLite, based solely on its field maintainability and lower weight, since it simmers no worse than the WhisperLite. Maybe when MSR comes out with the SimmerLite II, they will have produced a lightweight, white gas-fueled stove, that, like, actually simmers. But only if they use design engineers that genuinely appreciate the meaning of the word.